Willem-Alexander Claus George Ferdinand was born in the University Hospital, Utrecht, on 27 April 1967, the first child of Princess Beatrix and Prince Claus. 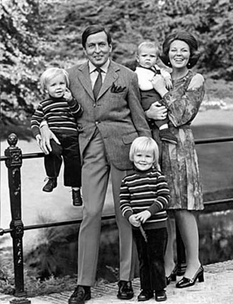 King Willem-Alexander with his parents and his younger brothers. At birth, King Willem-Alexander received the titles of Prince of the Netherlands and Prince of Orange-Nassau, Jonkheer van Amsberg. He was baptised in The Hague on 2 September 1967. His godparents were Prince Bernhard, Queen Margrethe of Denmark, Ferdinand von Bismarck, former Prime Minister Jelle Zijlstra and Ms Renée Smith-Roëll. King Willem-Alexander spent his early childhood at Drakensteyn Castle in Lage Vuursche. He has two brothers, Prince Friso (1968-2013), and Prince Constantijn (1969). In 1981 the family moved from Drakensteyn Castle to Huis ten Bosch Palace in The Hague.